Background: Osimertinib (OSI), also known as AZD9291, is a third-generation epidermal growth factor receptor (EGFR) tyrosine kinase inhibitor (TKI) that has been approved for the treatment of non-small cell lung cancer (NSCLC) patients. Objective: Establishment of the OSI-resistant HCC827/OSIR cell line and study of its resistant mechanism. Method: The anti-proliferative effect was studied through MTT and colony formation assays. The protein expression was detected by Western blot assay. The gene was silenced by small interfering RNA. The cellular morphology was observed by using an optical microscope. The viable cell numbers were counted by trypan blue staining assay. Results: The OSI-resistant HCC827/OSIR cells were established on HCC827 cells with naive EGFR-sensitive mutation, and the resistant effects of HCC827/OSIR cells were confirmed through MTT and colony formation assays. The IC50s of HCC827/OSIR cells to other EGFR TKIs, such as gefitinib, erlotinib, afatinib, and rociletinib was higher than that of the HCC827 cells. The anti-proliferative effects of paclitaxel, pemetrexed, doxorubicin, and fluorouracil in HCC827 and HCC827/OSIR cells were similar. The expression of inositolrequiring enzyme 1α (IRE1α) was increased after the cells developed resistance to OSI. 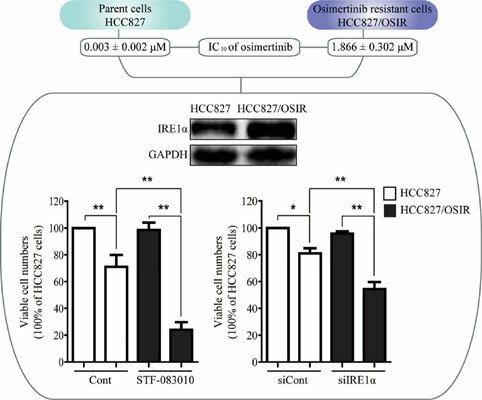 The number of viable cells in both cell lines, particularly in HCC827/OSIR cells, was decreased through knockdown of IRE1α or pretreatment with STF-083010, an IRE1α inhibitor. Conclusion: An increased expression of IRE1α may be one of the resistant mechanisms for OSI-resistant NSCLC. Osimertinib, AZD9291, EGFR, IRE1α, NSCLC, lune cancer.